I believe this is fixed by Blake's patch in bug 979378. Actually, I can't reproduce this even on vanilla nightly from the 6th, on Win 7 glass. Alice, do you know if this is Windows 8 specific or something? I cannot reproduce on Windows7 Aero/Classic. Probably, this is Winddows8.1 desktop specific. Can't reproduce on newer builds from fx-team --> marking wfm. I expect bug 979378 probably fixed this (but I'm not sure that's what it was). > I cannot reproduce on Windows7 Aero/Classic. > Probably, this is Winddows8.1 desktop specific. I can reproduce the problem on Windows7 if I set system font to "Meiryo UI" instead "Meiryo"(default of Japanese edition of Windows7). "Meiryo UI" is default system font of Japanese edition of Windows8.1 and 8. > > I cannot reproduce on Windows7 Aero/Classic. > > Probably, this is Winddows8.1 desktop specific. > I can reproduce the problem on Windows7 if I set system font to "Meiryo UI"
> instead "Meiryo"(default of Japanese edition of Windows7). > "Meiryo UI" is default system font of Japanese edition of Windows8.1 and 8. > I can still reproduce. Mike, weren't we struggling with centering the footer text? Can we fix this some way? Let's downgrade this to a P3- though, if it's just people with these fonts that hit it - Windows 8 is still a tiny minority, and users with that pref will be an even smaller minority of users. G_HZ, let's keep the rest of this in here... but can you tell me the DPI of your Win 7 machine, ie the settings under Control Panel > Appearance and Personalization > Display > "Make text and other items larger or smaller" ? Is it set to 100% or to something else? Blake, can you tell us why the flex: 0 was added? I talked with Stephen and we can probably increase the width for the single-view panels so they don't look so cramped. > single-view panels so they don't look so cramped. More specifically, he said 30em would probably be OK.
> Blake, can you tell us why the flex: 0 was added? I'll see what I can do here. Today, I notice this problem happens on Windows 7. And Aurora29.0a2 is also affected. 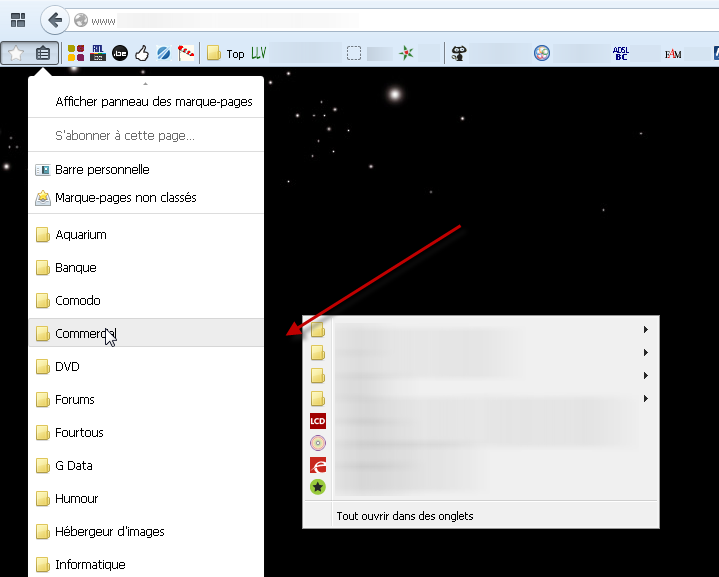 And, The menu items are cut off on a localized version of Aurora29.0a2. > I'll see what I can do here. Jared, you unassigned, did you not find anything? I may be able to have a look tomorrow... maybe we can just add the flex back? Yeah, I couldn't get anything to work here. Bug 982543 seems to be fixed on 29.0a2 (2014-03-15). The update today is very interesting. This was fun to reproduce. User impact if declined: users with non-default fonts on Win 7 and Win 8, and in some locales like Japanese, users with the default Windows font, will see the following symptoms in the bookmarks menu: cut off labels, shifting content, "missing" arrows for menus that have submenus (shifted out of view), and space between the parent menu and submenus when opening the submenus. Attachment #8391982 - Flags: approval-mozilla-aurora? 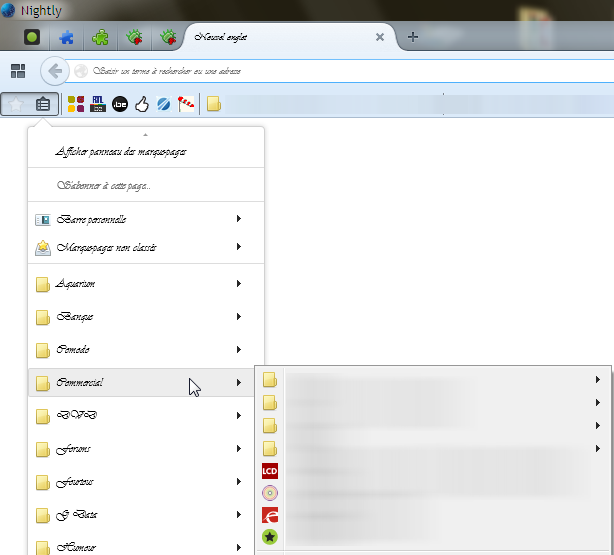 Verified fixed using Windows 7 64 bit and Mozilla/5.0 (Windows NT 6.1; WOW64; rv:30.0) Gecko/20100101 Firefox/30.0. Verified in latest Nightly as well, setting the STATUS to VERIFIED. I can also confirm this as verified fixed with latest Fx 30 beta 7 (Build ID: 20140522105902) on Windows 8.1 x64.